Mon., 27 Jan. - Tue., 4 Feb. Tue., 15 Oct. - Mon., 25 Nov. Mon., 3 Feb. - Sun., 16 Feb. Thu., 3 Oct. - Mon., 21 Oct. Sun., 16 Feb. - Fri., 28 Feb. Sun., 16 Feb. - Mon., 24 Feb. Tue., 3 Sep. - Fri., 13 Sep. Sun., 26 May - Sun., 23 Jun. Fri., 18 Oct. - Tue., 29 Oct. Mon., 4 Nov. - Mon., 9 Dec. Tue., 5 Nov. - Sat., 23 Nov. Mon., 9 Sep. - Sun., 29 Sep. Sun., 5 Jan. - Mon., 3 Feb. Sun., 26 Jan. - Mon., 3 Feb. Mon., 20 May - Thu., 27 Jun. 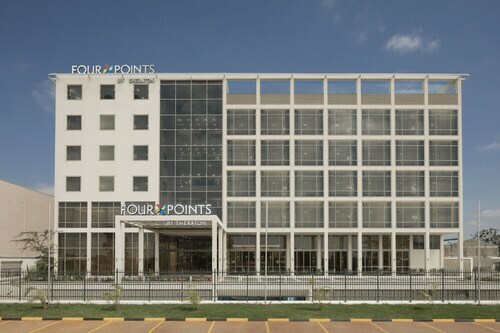 See all 676 properties in Jomo Kenyatta Intl. 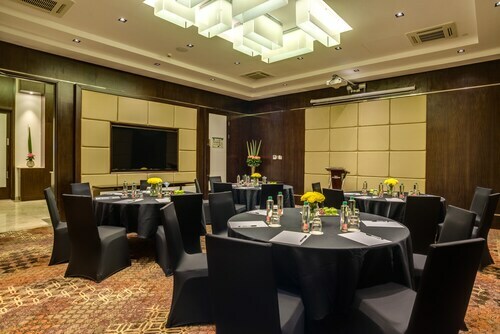 Very nice and modern hotel. Rooms are pretty nice, bed is very comfortable. Very clean, and only a year old. Service was great, location to airport, and a free reliable shuttle. 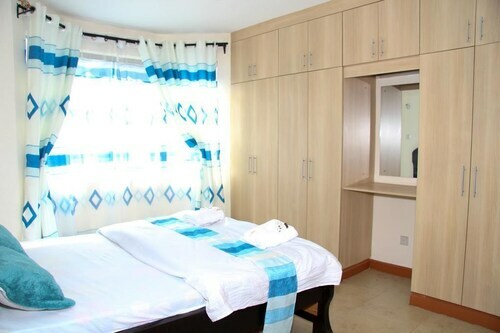 Situated in Syokimau, this apartment building is close to Gateway Mall. Area attractions also include Southfield Mall. 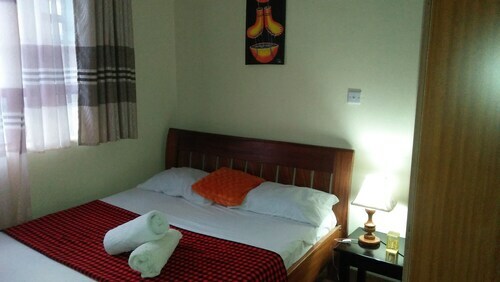 Situated in Syokimau, this bed & breakfast is close to Gateway Mall. Area attractions also include Southfield Mall. 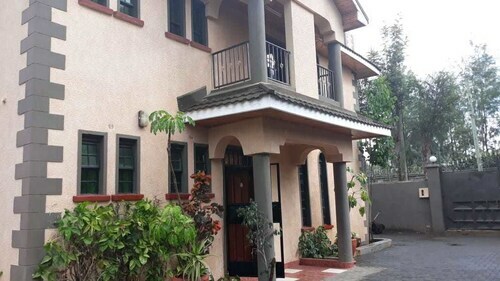 Situated in Syokimau, this guesthouse is 1.9 mi (3.1 km) from Gateway Mall and within 9 mi (15 km) of Nairobi National Park and The Nextgen Mall. Nyayo National Stadium and Strathmore University are also within 12 mi (20 km). Question : How much is a plane ticket to Nairobi (NBO) from Toronto (YYZ)? Answer : Cost can range anywhere from $961 to $6,820, prices for YYZ to NBO do fluctuate a lot more than most routes from Canada. The further out you book your ticket, the more likely you are to save on your trip. Answer : You sure can switch your departure or arrival date and you may save by changing when you leave. The lowest-cost day to fly in May is Sunday. Question : What airports do you fly into for Nairobi? Answer : Pearson International Airport is a wonderful airport, but there is a cheaper way to get to Nairobi— Billy Bishop Toronto City Airport. It's just 11 miles away from YYZ and flights are priced 17% cheaper over the upcoming months. Question : What is the cheapest airline flying from Toronto to Nairobi? Answer : Delta Air Lines strives to keep costs down for travellers over the next three months. Fares are being booked at just $961 and, when compared to the higher priced bookings of $6,820, it's quite a deal. Answer : The cheapest day to fly from Toronto to Nairobi is on Sunday. So, if you are trying to save a little cash on your next trip look for flights on Sunday. Question : What is the cheapest date to fly to Nairobi? Answer : As of Apr 22nd, the best day for booking to Nairobi (NBO) is May 13th. It cost $961, which is 55% below the average price to book the same route.